By October 1943, the tide of the war in the Pacific against Imperial Japan had turned in favour of the Allies. Following the defeat of Japan’s aircraft carrier fleet at Midway in June 1942, the offensive passed to the Americans with Australian and New Zealand forces in support. Key to pushing onward was the seizure of the Solomon Islands from Japanese control. Fighting in 1942 had secured Guadalcanal and throughout the middle of 1943, American forces pushed into the Central Solomon Islands. It was time for New Zealand forces - the Royal New Zealand Air Force (RNZAF) in particular - to play their part in the Pacific war. Aerial view of the airstrip at Ondonga, home of the New Zealand Fighter Wing, 1943. Image ref PR3614 ©RNZAF Official. The RNZAF fighter pilots of No. 488 Squadron and several other RAF units had first encountered the Japanese during the disastrous defeats in Malaya, Singapore and the Dutch East Indies from December 1941 to March 1942. Outnumbered, most of the New Zealanders were also inexperienced and flew the Brewster Buffalo, which was ill-suited to a land-based role and inferior in almost all respects compared to the nimble ‘Oscar’ and ‘Zero’ fighters, flown by experienced and skilled Japanese pilots. The survivors returned to New Zealand to form new units and re-equip with the more modern P-40 Kittyhawk, which began arriving in March 1942. The RNZAF sent its first fighter squadron on active operations in October 1942, when No. 15 Squadron deployed to Tonga. They moved to Guadalcanal in April 1943 where they destroyed their first enemy aircraft the following month. By the time they returned to New Zealand in late June, they had accounted for five Japanese aircraft. No. 14 Squadron then took over and claimed another 22 destroyed and four ‘probables’ during July 1943, losing only four Kittyhawks and three pilots in that time. The success of the Kittyhawk squadrons rotating in and out of the Solomons continued as the months passed. 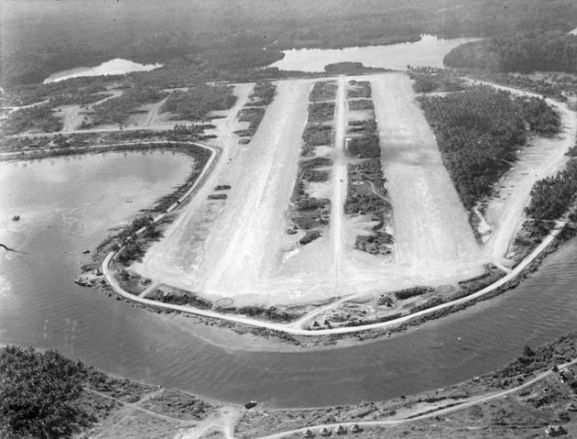 By October 1943, a portion of the Central Solomon Islands, including New Georgia, had been captured from the Japanese and new bases were established. On 5 October, RNZAF Station New Georgia at Ondonga was created and two Kittyhawk Squadrons, No. 15 and No. 18, arrived to form the New Zealand Fighter Wing. Two vital Servicing Units, No. 2 and No. 4, provided the essential ground support for the air crew. The creation of the New Zealand Fighter Wing was something quite new. Up to this point, squadrons had tended to operate individually, and this grouping of units, physically and administratively provided greater striking power. 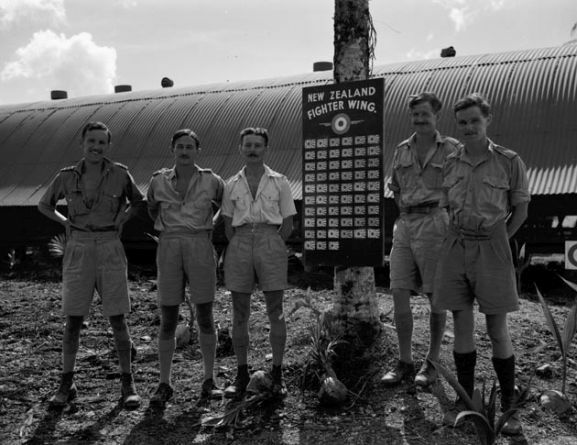 Group of Number 18 Squadron RNZAF officers with the New Zealand Fighter Wing scoreboard, Ondonga, New Georgia, November 1943. Image ref PR2367 ©RNZAF Official. Just a couple of weeks after its formation, The New Zealand Fighter Wing was called upon to participate in a unique engagement in the history of the New Zealand Armed Forces. As part of the capture of the remaining western portion of the Solomon Islands, 8 Brigade of the New Zealand Army’s 3rd Division was tasked with the capture of the Treasury Isles, consisting of Mono Island and the smaller Stirling Island. The operations against Mono Island began on 27 October 1943, involving mostly New Zealand troops, supported by a smaller number of Americans. The New Zealand Fighter Wing provided aerial cover, despite rain and squalls. After some brief fighting, in which the New Zealanders sustained light casualties, the Japanese defenders were overcome and Mono and Stirling Islands could be used as a base for further Allied operations. Group of Servicing Unit personnel performing maintenance on a Curtiss P-40 Kittyhawk at Ondonga, New Georgia, 1943. Image ref PR2051 ©RNZAF Official. The combined operations in the Treasury Islands were an important experience for the New Zealand forces, uniquely involving air, sea and land elements. The first major amphibious assault by New Zealanders since Gallipoli was a complete success. 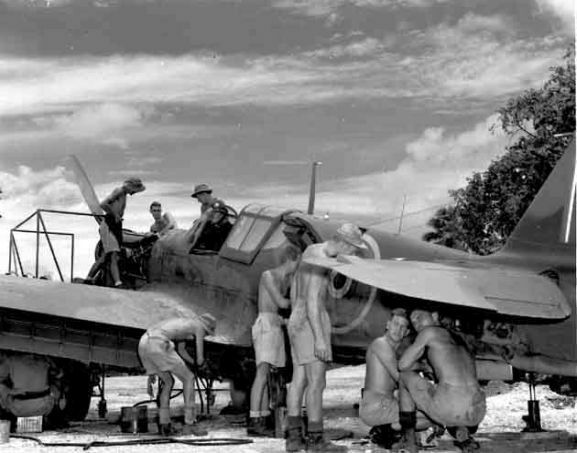 The RNZAF had played its part in the victory and the Fighter Wing continued to be successful for the remainder of 1943, as the Allies closed in on Bougainville and Rabaul. On 24 December 1943, twelve Japanese fighters were shot down on a single day, the highest number claimed by the RNZAF on a single day during the war. This marked the level of air superiority now enjoyed by the Allies in the Pacific, the achievement of which was due in no small measure to the efforts of the New Zealand Fighter Wing and their Kittyhawks. 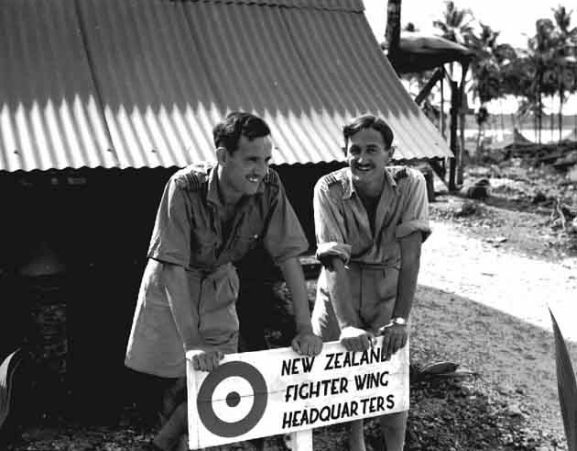 18 Squadron RNZAF fighter pilots Flight Lieutenant Jimmy Balfour (left) and Squadron Leader John Oldfield outside New Zealand Fighter Wing Headquarters, Ondonga, New Georgia, 1943. Image ref PR2360 ©RNZAF Official.